At the invitation of Vice Chancellor and Minister of Finance of Germany Olaf Scholz, Vice Premier Liu He of the State Council will visit Germany and attend the 8th Hamburg Summit of China-Europe Forum on November 25 to 28. Q: Can you give us more information on Vice Premier Liu He's visit to Germany? How do you comment on the current China-Germany relations? What is China's expectation for his visit? A: During his stay in Germany, Vice Premier Liu He will meet with German leaders to exchange views on bilateral practical cooperation, China-Europe relations and international and regional issues of mutual interest. Vice Premier Liu He will also attend and address the 8th Hamburg Summit of China-Europe Forum during which he will interact with other attendees of the Summit, including high-level delegates from the European and German side and the Mayor of Hamburg. In recent years, China-German relations have been developing at a high level with a strong momentum. 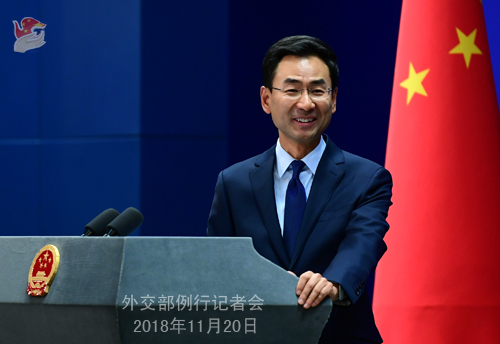 The two sides have witnessed frequent high-level exchanges, increasing political mutual trust, notable practical cooperation results, and closer interactions and coordination on international and regional affairs. Within this year, the two Prime Ministers paid visits to each other and the fifth China-Germany intergovernmental consultation achieved fruitful outcomes, which testifies to the closeness and high development level of bilateral relations. 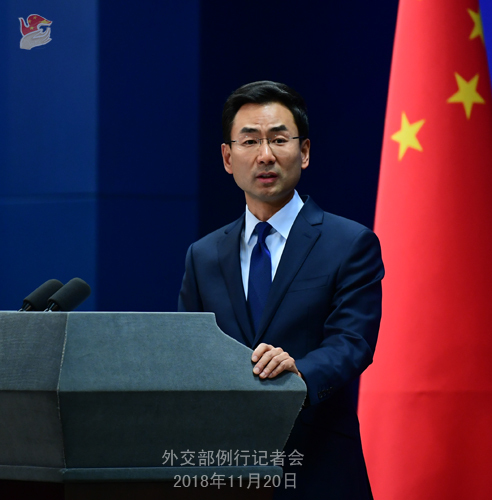 Under the current international circumstance, China and Germany, as two responsible major countries and comprehensive strategic partners, need to further strengthen coordination and cooperation, make joint efforts to uphold multilateralism and the free trade system and build an open world economy, and provide more factors of stability for the world. China hopes that Vice Premier Liu He's visit to Germany could further strengthen political and strategic mutual trust between China and Germany, and deepen all-around cooperation on bilateral, China-Europe, and global fronts, in particular practical cooperation in the fields of economy and trade, investment, finance, manufacturing and digitalization as well as industrial innovative cooperation between China and Germany and between China and Europe. Q: According to Australian media, an Australian official accused China of launching more and more cyber-attacks this year. He said that the objective is to steal Australia's intellectual property. So, are you aware of the media report and what is your reaction to that? A: Cyber security is a global issue and cyber-attack is a common challenge faced by all countries. Cyberspace is a virtual and complicated one where all parties' interests are intertwined. It shall be maintained by the international community, including the government, business, think tank and media sectors, with constructive efforts. Relevant reports and accusations are fabricated without facts but with hidden motives. They are unprofessional and irresponsible. They will only heighten tension and rivalry, instead of helping to protect the common security of cyberspace. 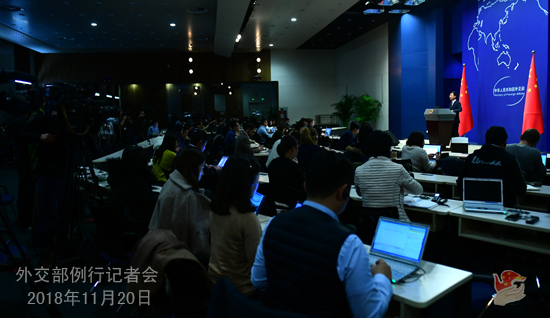 Q: We have noticed that some media are still following the story that this APEC meeting failed to issue a communique as usual, and relevant APEC members also stated their positions on this issue. What's your comment? A: Yesterday I already talked about what happened at this year's APEC Economic Leaders' Meeting and China's position. This meeting achieved positive outcomes in many fields like digital economy, connectivity and inclusive growth and can be called a success overall. China commends and appreciates the positive role Papua New Guinea has played as the host. This meeting failed to issue a leaders' communique as usual, a result China and most APEC members didn't want to see. As far as I know, the focal point of negotiations on the outcome document was about trade issues on strengthening and improving of the WTO. The vast majority of the members, in particular developing ones, made clear their explicit position of upholding the multilateral trading system, opposing protectionism, and avoiding to rush to conclusions on relevant specific issues. But certain economy just refused to take in the voices of the vast majority and rejected to incorporate these reasonable propositions into the outcome document. Instead, it insisted on adding contents that undermine other countries' fundamental interests and legitimize its protectionist and unilateral actions. When consensus was absent, it tried to ram through the contentious document and force others to accept its text. Such behavior violated the APEC principle of consensus-building and harmed the shared interests of all parties, to which China and many other members unequivocally expressed opposition both at the meeting and during negotiations. China has all along been supporting Papua New Guinea in successfully hosting the meeting. When conferring on the outcome document, we have been acting in a responsible and constructive way and sticking to consultations to bridge differences. China has done its utmost to push for a consensus and did not give up until the last second. We did that in all sincerity and we did that because the APEC principle of consensus-building must be upheld. It needs reiterating that whether it's about promoting APEC cooperation or discussing WTO issues, all parties' opinions deserve a listen, equality and mutual respect are indispensable, and differences should be resolved through negotiations. China is firmly committed to building an open world economy, supporting APEC in playing a positive role in promoting trade and investment liberalization and facilitation in the Asia-Pacific, and upholding the WTO-centered multilateral trading system. We stand ready to work with all parties in this regard. Q: The Maldives's new government said that it will pull out of a free trade deal that it reached with China because some senior Maldivian politicians said that the deal is one-sided and China is not buying anything from the Maldives. I am wondering if you have any comment on this issue? A: The Free Trade Agreement between China and the Maldives is based on equal-footed and friendly consultations. It is to seek mutual benefit and win-win results. The sooner it gets implemented, the sooner the two sides could reap the benefits. We believe the Maldivian government will make the right choice. Q: The newly-elected President Solih of the Maldives has also said that the new government would like to review and audit many Chinese projects, in view of the financial situation and corruption issue it is facing. How does China view the situation in the Maldives after the change of government there? Previous President Mr. Abdulla Yameen is regarded as pro-China while new President Mr. Solih is closer to India. A: I am not aware of the specific situation you mentioned. According to my knowledge, Special Envoy of President Xi Jinping and Minister of Culture and Tourism Luo Shugang not long ago attended the inauguration ceremony of President Solih and had a meeting with him. During the meeting, President Solih said that the new Maldivian government attaches importance to and is committed to developing its relations with China, and stands ready to deepen bilateral practical cooperation and substantiate bilateral relations. President Solih also said that China has offered the largest amount of economic and development assistance to the Maldives. The opening to traffic of the China-Maldives Friendship Bridge has greatly improved the traveling conditions for local people, making the Maldivian side feel earnestly the benefits of bilateral cooperation. The Maldives welcomes more Chinese enterprises to invest in its country. All these facts reflect the status and significance of the China-Maldives practical cooperation. As for the foreign policies practiced by Maldivian former President Yameen and new President Solih, you'd better ask the Maldivian side. China's determination to deepen practical cooperation and maintain a sound development momentum of China-Maldives ties is consistent and clear. Q: Some reports say that President Xi Jinping will travel to Spain next week. Do you have information about this? A: Regarding Chinese leaders' travel plans, the Chinese side will release relevant information in due course. You may keep following that. Q: According to reports, Dalai Lama gave a speech in Tokyo today in which he said Tibet and China should find a way to co-exist and prosper together. Does the Foreign Ministry have any comment on that? A: Tibet is part of China's territory. The Tibet issue belongs to China's internal affairs and is not a diplomatic question. As the Spokesperson of the Foreign Ministry, I have to point out that the 14th Dalai Lama is a political exile under the cloak of religion who has long been engaging in anti-China separatist activities. We hope the relevant party will not in any way support or facilitate his anti-China separatist activities.